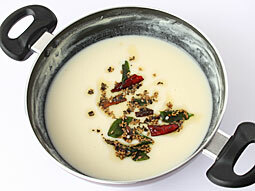 Gujarati Kadhi is one of the best recipes of Gujarati cuisine. This authentic recipe requires knowledge of cooking with Indian spices and it gets its delicious taste from curd, besan and curry spices. Unlike other recipes, Gujarati dahi kadi uses less besan and has sweet and sour taste along with comparatively thinner consistency. Whether you serve it with steamed rice, simple rice khichdi or vegetable pulav, it is surely going to tantalize your taste buds. Notes for Tempering: If you are in a hurry, you can do the tempering first and then add gram flour mixture to the same tempering pan in step-2. Beat curd and gram flour until smooth using hand blender. Make sure that there are no lumps in the mixture. Add 2 cups water and beat again. 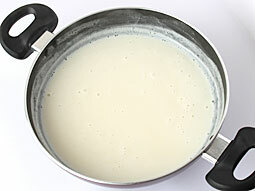 Transfer prepared curd-gram flour mixture to a medium size deep pan and bring it to boil over medium flame. Add crushed green chilli-ginger, crushed garlic, sugar and salt to taste. Stir to mix well and cook on low flame for approx 10 minutes or until raw smell of gram flour goes away. It should be runny. If required add 1/2 cup more water. 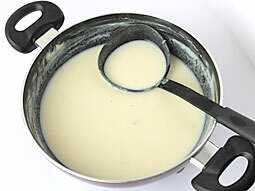 Meanwhile, prepare tempering by heating oil or ghee in a small tempering pan. Add mustard seeds and fenugreek seeds, when they start to crackle, add cinnamon, cloves, cumin seeds, dry red chilli and curry leaves; sauté for 30-40 seconds on low flame. 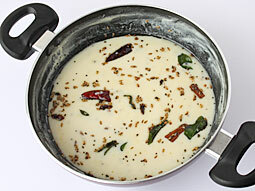 Take tempering pan away from flame and pour tempering over Gujarati kadhi; mix well. After adding tempering, let it boil for 2-3 minutes. Turn off flame and garnish it with finely chopped coriander leaves. 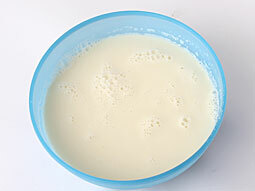 If curd is not available, then use 2 cups sour buttermilk and 3/4 cup water as a substitute of 3/4 cup curd and 2 cups water. 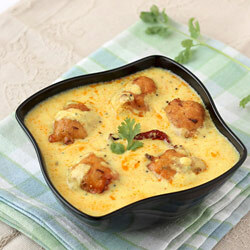 If you like thick texture of dahi kadi, then increase the quantity of gram flour to 3 tablespoons. 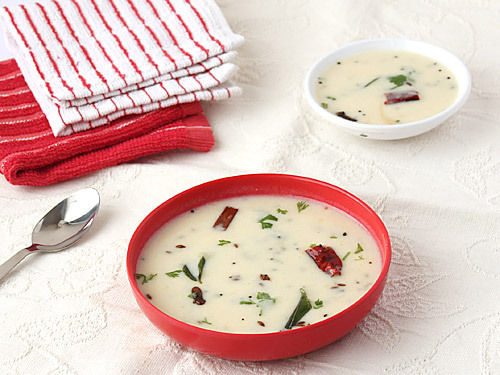 Kadhi prepared with this recipe has white color. If you would like to have it a yellow color, then add 1 pinch turmeric powder in step-3. 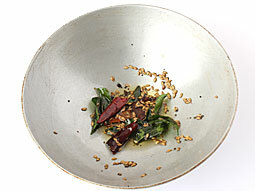 Serving Ideas: Traditionally it is served with plain rice khichdi. However, you can make your lunch or dinner more palatable and enjoyable by serving it with masala khichdi. Also, it can be served as a substitute of moong dal in Gujarati meal. I tried this recipe. Everyone in my family enjoyed it and my friend is going to make it tomorrow. So easy So tasty. I've tried this recipe. It's so easy. I like that the tempering has so many tasty flavours. Thank you for sharing. It reminds me of my childhood, I had it when I attended a wedding in Ahmedabad. Now, that I have the recipe, I’m going to cook it myself. Thanks a ton. Your website had everything a normal cook needs to make daily. Beautiful. I have just completed my trip to Gujarat's Gir National Park and during my stay there i was served kadhi and i simply fell in love with it. After reading your recipe, i gave it a try and am loving it. This dish and photo is amazing!